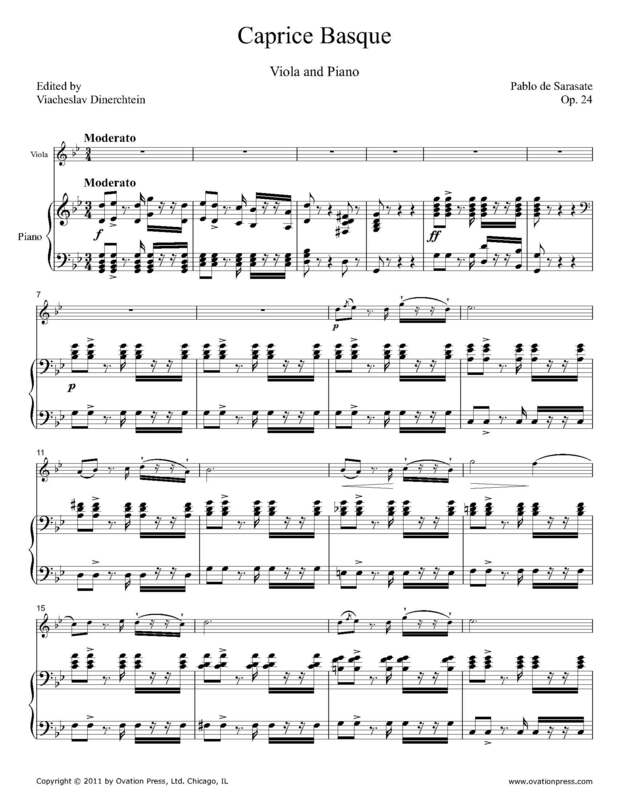 This arrangement of Sarasate's Caprice Basque for viola and piano will best suit an advanced player, prepared to set aside all prejudices of what can or cannot be played on the viola. While it is commonplace to simplify double-stops, shorten arpeggios, make cuts, and so on when making a violin-to-viola transcription, no such concessions have been made here. The absence of such concessions was a conscious decision: there is nothing in the original that could not be translated into the viola, which obliges us to bear in mind that the Caprice Basque was penned by one of the most prominent authorities in the history of string performance. As some might argue, the viola is by its nature a more difficult instrument to master than the violin. And while this may be true, having too acute a mindfulness of it may block the road to any serious attempt to expand the technical horizons of viola playing. The truth of the matter is this: the Caprice Basque lies comfortably within the viewable horizons of what is ‘playable’ on the viola, and we cannot but remind ourselves of compositions of much greater technical difficulty that are successfully performed on the cello, whose technical command calls for yet greater physical effort. While the solo line of the Caprice Basque was left intact, in-depth consideration has been made in regard to fingerings and bowings, which often did need to be re-adjusted to the instrumental particularities of the viola. The piano accompaniment underwent modifications as well, as to make it avoid stepping on the solo line without sinking into too low a register. The Caprice Basque lends itself beautifully to the viola timbre and does not lose any of its flare upon being transposed a fifth lower.